Make it all about your unique style! Promise me, there will be no KISSING!!! 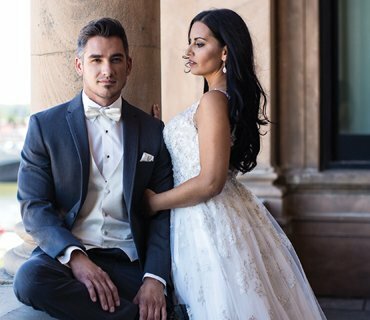 When it comes to weddings, proms, quinceañeras, cotillions, cruise or special Black-Tie events, your customers deserve a perfectly fitted tuxedo and suit rentals from Elegant Penguin. From the moment you view our collection of tuxedos, suits and accessories, you will understand what sets us apart from all others. The Elegant Penguin collection of tuxedos, suits, vests, ties and shoes represent exactly what your customers are looking for. When it comes to deciding what will look best on your customers, we make it easy. The entire collection is carefully curated by fit, color, style and special features. Do you have any questions? Whenever you do, our professional staff will be happy to share their knowledge and expertise. We are always available to assist and advise you, to make your business a little easier. Elegant Penguin is the leader in fine men’s tuxedo and suit rentals for our business partners. Just take a look at our extensive collection of men’s formal attire, suits and fine accessories. You will see the latest in men’s formal fashions from such renowned wedding and special occasion designers such as Michael Kors, Ike Behar, Allure for Men, Couture 1910, After Six, Marks of Distinction and Black Label exclusives. Elegant Penguin can fit everyone! From a child’s size 3 to a gentleman’s size 80, our collection of the newest Ultra-Slim, Slim and Modern Fit tuxedos and suits will please everyone. When you combine our tuxedos and suits with vests, ties and shoes from our exciting accessories collection, you’ll create the perfect look.